Imagine, then, my surprise when I arrived in Moscow and found a city of rampant capitalism and sublime beauty. Google rather than gulags. Lamborghinis rather than Ladas. Marks and Spencer rather than Marx and Lenin. And all around, a city as beautiful as any I’ve seen. This is the Moscow in which we have been living for the past four days. We have been housed aboard the ship, docked in the Moscow Canal. Viking provides buses into Red Square every day, along with tours and concerts should we desire them. 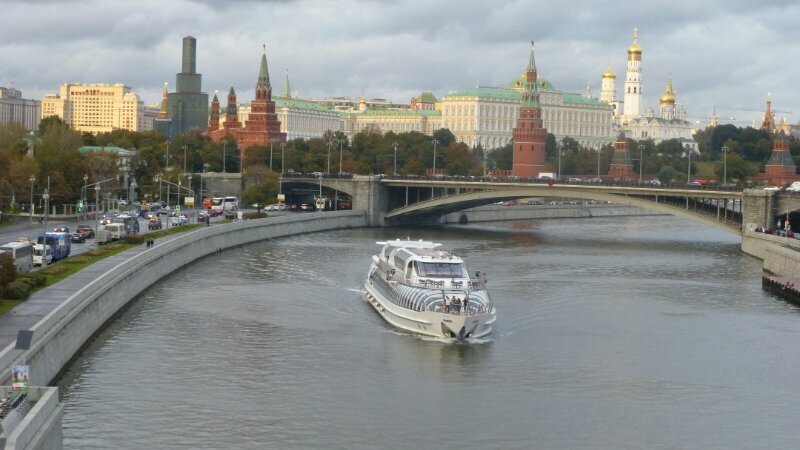 We’ll leave Moscow later today, headed downriver for St. Petersburg. It’s those trips to Red Square that have astounded me. Red Square, after all, is the place where goose-stepping soldiers and lurking missiles used to parade, filling our 21-inch screens with fear and loathing of the Communist regime. Today, Red Square is packed with tourists, pickpockets, and kiosks selling fur caps. The closest thing to a weapon here is a selfie stick (and there are plenty of those). And so, with this post, I present a few pictures of Red Square as it appears today. St. Basil’s Cathedral and the Kremlin wall, Iverskaya Chapel and the Resurrection Gate, Lenin’s Tomb and — I’m sure you’ll hear more about this when Louise takes the reins — the colossal GUM department store. The tiny Iverskaya Chapel (blue dome) and the Resurrection Gates were demolished in the 1930s to make room for parading military vehicles. Rebuilt in the 1990s. Disappointing post. What about Lenin (not Lennon)? Four days in port? What happened to the river cruise? Who cares about the department store? Keep calm, ‘Wreck, and take your meds. We’re on the Volga now (having traveled much of the Moscow Canal — eight locks! — overnight) and are marveling at all the riverside dachas. Don’t believe the history books: materialism is thriving in this place.